Italy coach Nick Mallett has named his 30-man squad for the Rugby World Cup in New Zealand, recalling experienced flanker Mauro Bergamasco following injury. Sergio Parisse has retained the captaincy for the tournament, with Bergamasco bolstering their options after a summer stint with Italy 'A' in the Churchill Cup following a shoulder problem. Treviso loose forward Manoa Vosawai and club team-mate Valerio Bernabo both failed to make the cut in a competitive back-row. "In the back-row, the competition for places was very high," Mallett said. "It is not easy to have to do without an impact player like Vosawai but with Sergio Parisse and Alessandro Zanni, the role of No.8 is covered. Robert Barbieri, Paul Derbyshire and an experienced player like Mauro Bergamasco guarantees us presence and confidence on the pitch." 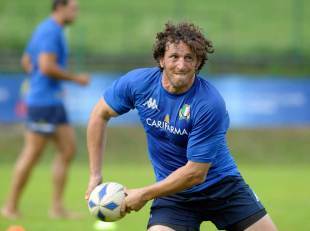 Bergamasco will turn out for his third World Cup - a mark equalled by prop Andrea Lo Cicero - while 14 players are set to grace the stage for the first time, including the uncapped duo of Tommaso D'Apice and Cornelius Van Zyl. Mallett, who will be replaced by Perpignan boss Jacques Brunel after the World Cup, has been unable to call on first choice fly-half Craig Gower due to a knee injury, choosing to utilise Luciano Orquera and Riccardo Bocchino as his options at No.10. "From our point of view, Orquera is the most complete player for No.10 and Riccardo Bocchino has in these weeks shown great determination and will to mature and be part of the 30," Mallett said. "This group is the result of four years of work. We have no doubt that the quarter-finals are within our capabilities." Italy will play two warm-up Tests, against Japan on August 13 in Cesena and Scotland in Edinburgh a week later. The Azzurri, who have never progressed beyond the group stages in the World Cup, are in Group C along with two-time champions Australia, Ireland, Russia and the United States.